AHDB's latest Beef and Lamb Watch figures have been released, highlighting retailer performance by percentages of British facings. The results demonstrate Morrisons, Aldi and Co-op’s underlying commitment to British on fresh red meat remaining at 100%, across the seasons. The results show that other retailers continue with a ‘best in season’ policy. Waitrose ensures 100% stocking of British lamb within their dedicated season as well as being fully committed to British beef, standing behind the great quality of British red meat. Tesco has also seen improvements to British lamb facings, up 39% on the year to now total 70% British lamb facings. The NFU plans to meet with Tesco in the coming weeks to understand what these drivers are and if they plan to continue this positive trend. 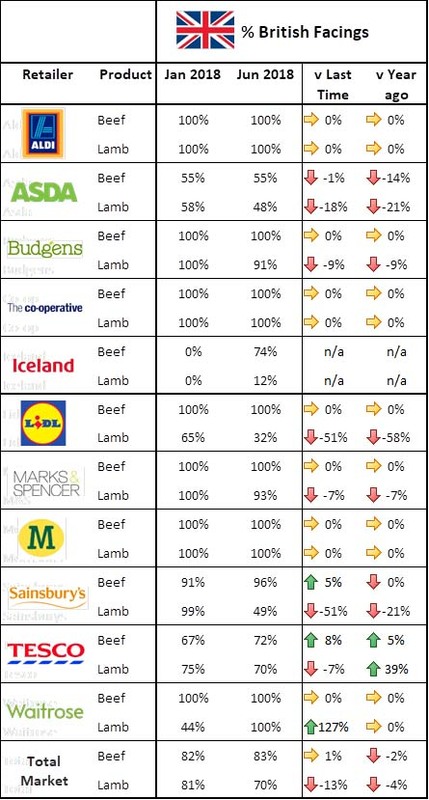 Disappointingly both Asda and Sainsbury’s have seen declines in British facings, with Asda decreasing the level of facings across both the Beef and Lamb categories. Meanwhile Lidl has maintained a 100% pledge to British Beef, but has seen substantial declines in lamb facings (down 58% on the year), particularly disappointing as we enter our peak lamb season for British product. The NFU has made contact with these retailers to understand why these retailers have seen declines in volumes, early conversations have indicated that many retailers feel that the number of lambs which are available at this point in the season is lower than they would normally expect. The NFU will continue these conversations.